IIVA offers Vedic Maths Teacher Training certificate program that includes all level training for which you need not buy any franchise. It is not mandatory that after taking Vedic Maths training, you will have to open a Vedic maths center. Candidates preparing for entrance exams, skill development, or for business purpose etc. can join certificate programme. This certificate programme includes an in-depth study of Vedic Maths sutras. After the successful completion of Vedic Maths training, a candidate is free to take Vedic Maths classes. This certification has not only helped students but also helped in generating self-employment. Vedic Maths Training provided by IIVA trainers help the learners to develop innovative mathematics skills and invent their own methods instead of using a predefined method for solving a puzzle. Our course fee includes comprehensive study material which helps the learner to understand and learn in a better way. 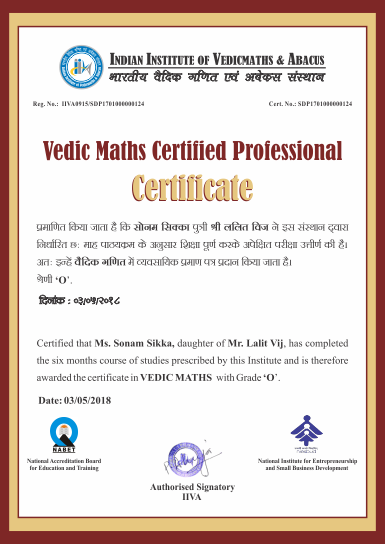 Vedic Maths certified trainers trained by IIVA can grab lifetime business opportunity by opening their own educational training institutes or by working with prestigious educational organizations. With a very small amount of investment in certification, anyone can become a certified professional and get recognition in society. Without any compulsion for becoming a franchise, IIVA provides unmatched opportunity to become a professional. The importance of Vedic Mathematics lies in the fact that any type of complex and critical multiplication or division can be done with simplicity. Vedic Mathematics is a compilation of tricks that help in solving mathematical calculations quite easily. People can now try out their own new methods as they are not limited to one method. Vedic Mathematics is very easy to understand and practice. IIVA offers students the opportunity to learn different but interesting, easier and faster methods to do maths. This six months certification course is valid across India and considered as an added qualification while applying for any teaching job. Training can be taken through online/offline mode. Who can join Vedic Maths Training Programme? Though the course does not aim to teach teaching, it includes advice on teaching. We offer you to learn the unconventional and useful methods of doing maths mentally, faster and accurately without creating hindrance in your routine work. This certification course is offered at many locations across India through our trainers. 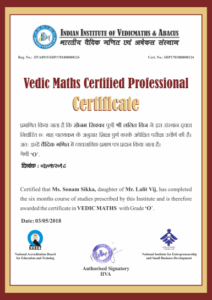 After the successful completion of Vedic Maths Teacher Training course, you will be given a Certificate in Vedic Math.